Geneva, Switzerland, 15 November 2017 – MSC Cruises, the world’s largest privately owned cruise line and market leader in Europe and South America, celebrated today a further acceleration in its industry-unprecedented ten-year investment plan. Under the €9 billion plan, six of a total of 11 new ships will have come into service between June 2017 and November 2020, resulting in a doubling of the MSC Cruises fleet capacity in just three and a half years. The second part of the proceedings was the traditional coin ceremony for MSC Bellissima where two commemorative coins were placed into one of the ship’s blocks as a sign of blessing and good fortune for the ship and her crew. The two mega-ships are due to come into service in March 2019 and November 2019, respectively. 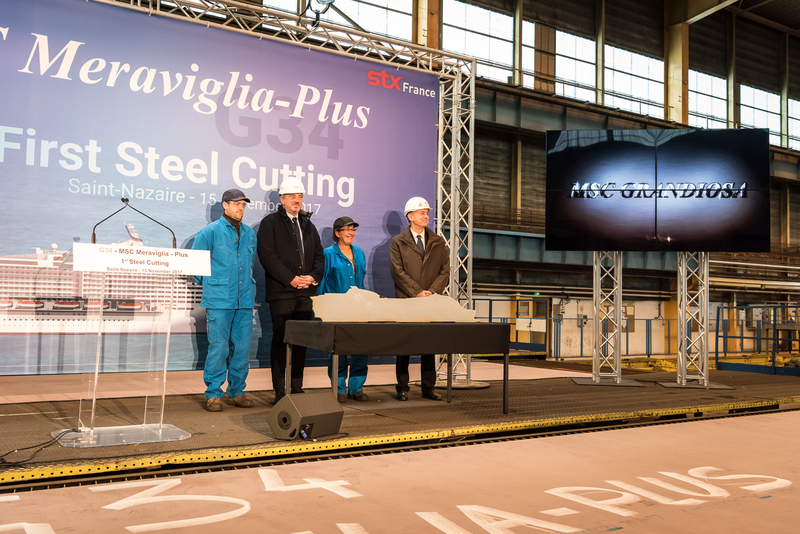 Laurent Castaing, General Manager of STX France , commented: "Today as we celebrate a cutting of the first steel and then a keel laying in the same day, we are living an unprecedented experience that marks the beginning of a new era, both for our client and for our yard. For MSC Cruises, it is the realization of an extraordinary investment plan, which will elevate the Company to become one of the three largest players in the global cruise industry; for us, it is the illustration of our very healthy order book, which leads us to deliver two ships a year until 2022. We are partners in the same virtuous circle, where boldness and the performance of each is a benefit to the other." The Meraviglia-Plus ships are a further evolution and enrichment of the highly successful Meraviglia prototype, which includes MSC Meraviglia – in service since June of this year – as well as MSC Bellissima. They feature 181,000 GRT’s, 331 metres in length and maximum capacity of 6,334 guests. The fact that this highly successful prototype can be extended is further proof of the engineering capabilities of the partnership between STX France and MSC Cruises and will bring guests an even more connected and rich cruise experience. In fact, the Meraviglia-Plus ships will feature the very first fine art museum at sea, with a collection of classic and contemporary art, elevating the entertainment experience on board to a whole new level and giving guests access to some of the world’s most beautiful works of art. Another key highlight on board both MSC Bellissima and MSC Grandiosa will be Cirque du Soleil at Sea. The long-term, exclusive partnership between MSC Cruises and Cirque du Soleil is setting new standards in live entertainment at sea and will see the world’s leader in artistic entertainment create a total of eight original shows that will be exclusively available on MSC Cruises’ Meraviglia and Meraviglia-plus generation ships. Each of the four ships will feature two brand new contrasting shows, the first two debuted on MSC Meraviglia in June this year and creative work is underway on two more shows for MSC Bellissima. 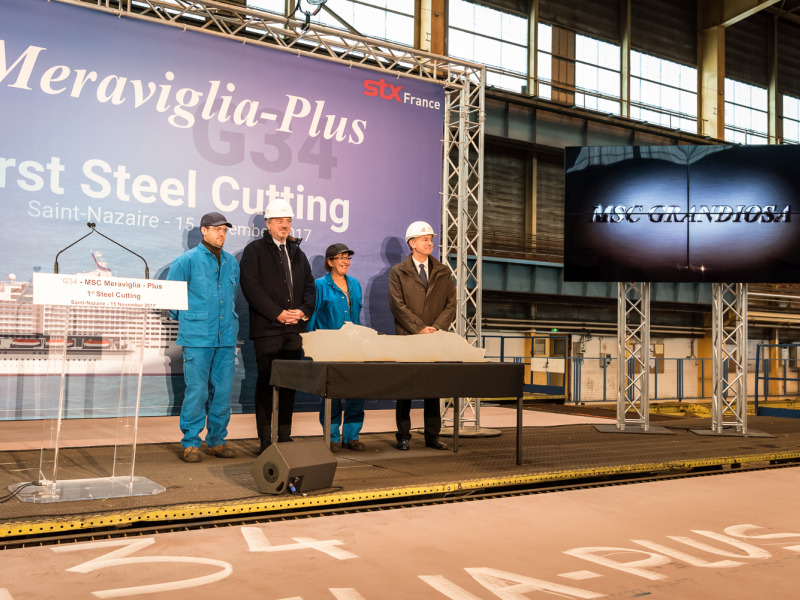 The two ships celebrated today are part of MSC Cruises’ existing investment plan, which includes the development of new prototypes for each of the three new classes of ships – the Meraviglia class, Seaside Class and World Class. This June, MSC Cruises launched the first of these new ships, MSC Meraviglia in Le Havre France and in December MSC Seaside will come into service in Miami. In June 2018 MSC Seaview will join the ultra-modern fleet. MSC Cruises is the first global cruise line brand to develop an investment plan of this length and magnitude, a testament to the Company’s ambition. Sales are already open for MSC Bellissima’s inaugural summer season in the Mediterranean. The much-awaited opening of sales for MSC Grandiosa will be announced soon. To find out more about MSC Cruises and its fleet visit http://www.msccruises.com/en-gl/Discover-MSC/Cruise-Ships.aspx.